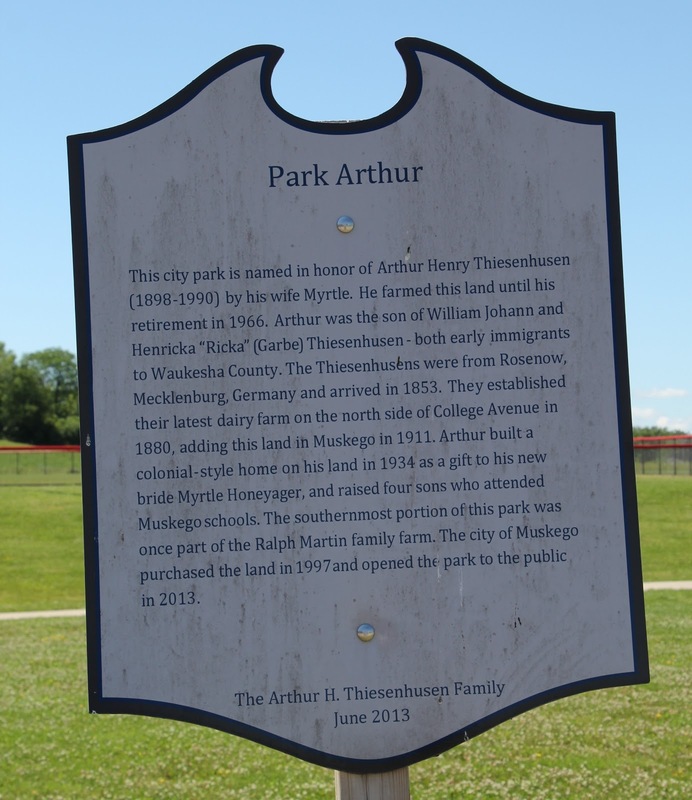 This city park is named in honor of Arthur Henry Thiesenhusen (1898-1990) by his wife Myrtle. He farmed this land until his retirement in 1966. Arthur was the son of William Johann and Henricka "Ricka' (Garbe) Thiesenhusen - both early immigrants to Waukesha County. The Thiesenhusens were from Rosenow, Mecklenburg, Germany and arrived in 1853. They established their latest dairy farm on the north side of College Avenue in 1880, adding this land in Muskego in 1911. Arthur built a colonial style home on his land in 1934 as a gift to his new bride Myrtle Honeyager, and raised four sons who attended Muskego schools. The southernmost portion of this park was once part of the Ralph Martin family farm. The city of Muskego purchased the land in 1997 and opened the park to the public in 2013. The marker is located at the center of Park Arthur, adjacent to the baseball diamond, public bathrooms, and picnic shelter, and is accessible from the park road between College Avenue / County Highway HH (to the north) and Martin Drive (to the south), Muskego, Wisconsin 53150. The marker is located at Park Arthur.